“…very dangerous…” indeed. We can only hope that this doesn’t turn into the story about, “I had some mice, so I got some cats. Then the cats took over and I got some dogs.” Etc. I have some great pictures of the stuff that I took along the Green River last year. I had never seen it in bloom before, it’s actually unique and pretty. I would include a picture in my comment but I am not sure how to do that. Can you copy and paste Salle? I’d be interested to see if its what I have growing here that was not around 3 years ago. Maybe send it to Ralph and he could post it? Course I think Ralph is not in the house right now…..Haven’t seen him on the blog. The variety of tumbleweed I have here now is dark green in color, with stickers, low to the ground, and spreads out. Usually find it along the driveway, not out in a field. Dries up in the fall and blows around. Thanks. Salle! I have put it up in the body of that post. Nice photos! The once I put up I think was especially unique. 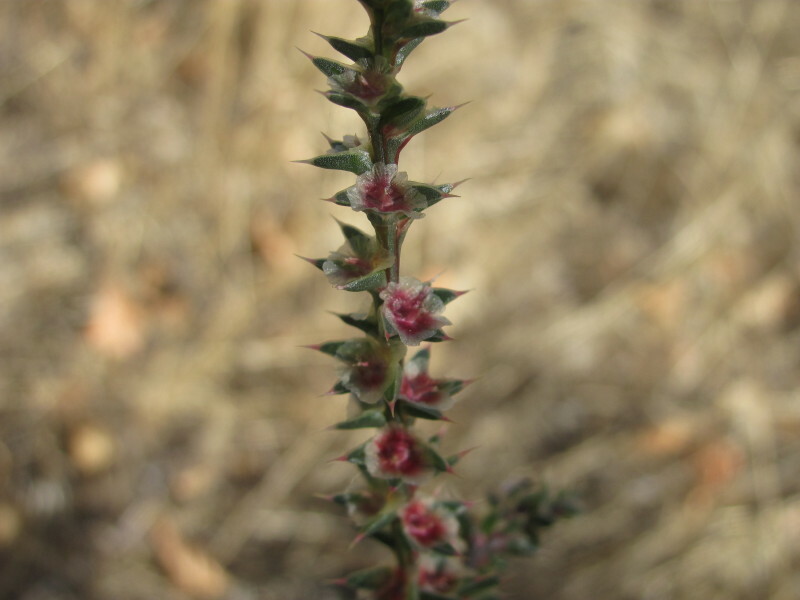 It shows how sharp Russian thistle really is. I am around today. Terrible Memorial weekend weather!. It rained 14 hours in Pocatello without a stop. A little sun is coming out now, but it is only 40 degrees at our modest 4500 feet in SE Idaho. By the middle of next week I will probably be able to take off for some outdoor fun. The weather report finally appears to be optimistic. To add a little to the description, I would say that I saw a wide variety of sizes of this plant, from waist high to less than knee-high. The flowers’ colors ranged from deep red to white and everything in between, the leaves were always rather dark green. the photos were taken early in the morning as I had 720 miles yet to cover that day and this was just an overnight camping stop on a longer journey. This, in dried form, is what I normally call tumbleweed and that seems to be everywhere all year round. Thanks for posting the pic Ralph! Its been snowing and raining over this way all day and more of it on the agenda tomorrow. Salle – it kind of looks like the same plant but what I have here, spreads out at ground level, doesn’t have much of a root system and when it dries out, it curls up and blows around like tumbleweed. That’s pretty much what this stuff is/does. There was another pic showing more of the plant structure. It has long, or not so long branch-like stems that rise up from a central point near the ground; the whole thing resembles the outline of a sphere, so I can see where this would be the plant I suspected it to be. I’d be willing to bet that it is the same thing.